Features & Benefits Maximum Distance Features a 3% larger core for maximizing energy transfer at impact for higher velocity and driver distance. Softest Feel No distance ball delivers a softer feel from tee to green. Compared to traditional two-piece distance balls, the Soft Feel delivers soft feel on impact. Exceptional Control The specially formulated soft ionomer cover is 14% thinner for excellent control on the most challenging approach shots. This ball gives me 10+ yards of distance over previous ball I used. Good feel off the putter. Played the local par 3 with it and using the normal clubs I grab for each hole, I found myself over shooting several from the tee. The additional yardage was 10 to 20 yards. This will be my ball from now on. 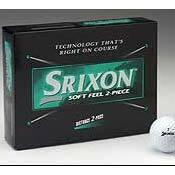 The Srixon Soft Feel plays as well as the Titleist Velocity and is more durable. Srixon seems to have made a 2010 model. They claim that this one is for slower swingspeeds and goes straight. I must say, it does the job wel! It flies very straight with a mid- to high trajectory. And goes very far, about 10 meters further than any other ball ive played. It is very durable aswell: played a round without even a scratch on it. Downside is that it does not hold a hard green. So you have to aim on the fringe and let it rol up to the pin. Titleist solo,ProV1,NXT. Srixon Z-star,Zurs. Precept Utri Tour, Extra distance. Pinnacle gold exception etc. okay this ball actually plays better than it looks. Ordered the ball fromn some dodgy ebay site and wanted to return due to the shininess of the balls (looked fake). Anyway persevered and have played a number of rounds. Great of the tee, great off the fairway, rough etc. The green is the problem. Off the putter simply does not feel comfortable. Different strokes for different folks. Erratic at best. If you are confident with your putting - give it a go and let us know. Have always played the DT So/Lo but they have stopped making it, so I picked out 3 new balls to try and bought a sleeve of each Srixon Soft Feel Srixon AD-333 and Nike Power Distance Soft. The Nike was OK but felt heavy off the tee but ok otherwise. The AD-333 felt hard off the putter and since I have a slice issue with an out to in club path the fact it generates more spin off the driver was an issue. The soft feel felt great from tee to green definitely my new ball and would even choose it over a So/lo now. I played a few sleeves of these after a recommendation by a club pro. I normally shoot in the high 70s, and I find these balls to be ideal for cold weather environments. They are my go to balls for early spring and late fall months. In the summer, I switch to my three piece balls (Nike Ones or Titleist NXT Tours) since. These balls have great distance and bite as good as a 2 piece ball can (and in fact out-spin some hard 3 piece balls). They feel very soft upon solid contact. A good ball for most golfers. Very affordable price, around 20 to 25 dollars a dozen. I am very impressed with these balls. I play the game pretty often and shoot a 7 handicap. These balls came to me as a gift and I tried them at a time when I was swinging the club pretty well. They travel as far off of the driver as any other ball I have used. They are like hitting a marshmallow when you catch them on the sweetspot. They also spin well and feel great around the greens. You can't beat the price.